Council chief Martin Tett has reacted with dismay to The Queen granting the HS2 scheme royal assent this week, saying that it will have a 'devastating impact' on the area. Mr Tett, who chairs the 51m collection of councils who are opposed to the high speed rail project spoke out over what he sees as a 'poor business case'. The Parliamentary Bill to build the line from London to Birmingham received royal assent on Thursday morning, opening the way for construction work to begin. It has had more than three years of scrutiny including a failed eleventh-hour bid to defeat it in the House of Lords last month. The Department for Transport said HS2 will create around 25,000 jobs during construction as well as 2,000 apprenticeships. It will also support growth in the wider economy, worth an additional 100,000 jobs. 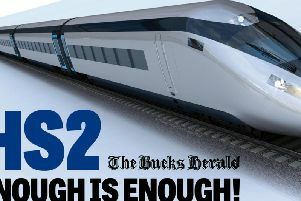 Leader of Buckinghamshire County Council, Martin Tett said: “I continue to believe that HS2 is the wrong solution with a poor business case and a devastating impact upon the Bucks environment. "Regretfully this has now received Royal Assent and in the best interests of our residents we must now work to ensure that HS2 Ltd is held to account for the mitigation assurances it has given. HS2 will start at London Euston, and trains will call at a new interchange at Old Oak Common before heading north through and often under the Chilterns, Oxfordshire and Warwickshire. The next stop will be at Birmingham Interchange, providing connections with the West Coast Main Line and Birmingham International Airport. East of central Birmingham a triangular junction will be built, allowing trains to turn right and head for a terminus at Birmingham Curzon Street, while other trains will be able to continue north as far as Lichfield, where a connection will be made with the existing West Coast Main Line. Phase 1 is expected to open in 2026, while a further section known as Phase 2a is set to follow a year later which will extend high speed running to Crewe. The rest of Phase 2 should open in 2033 and consist of two spurs. One will be between Crewe, Manchester Airport and Manchester Piccadilly, while the other will link the West Midlands with the East Midlands and Yorkshire, with connections in South Yorkshire and a terminus at Leeds. Transport Secretary Chris Grayling described the process of getting the legislation through Parliament as “long and arduous”, and said getting the go-ahead to start construction is a “massive boost” to the UK’s future economic prosperity. He went on: “HS2 will be the world’s most advanced passenger railway and the backbone of our rail network. Joe Rukin, campaign manager at Stop HS2, claimed the parliamentary Bill receiving royal assent was “a triumph of spin over evidence-based policy”.